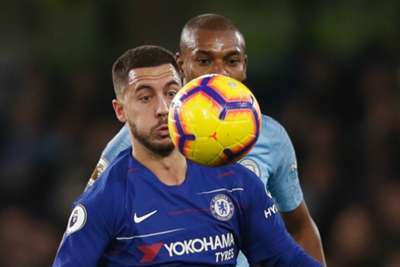 Eden Hazard feels Manchester City are still the best team in the Premier League despite Chelsea inflicting the champions' first defeat of the season. Goals from N'Golo Kante and David Luiz earned the Blues a 2-0 victory against City at Stamford Bridge on Saturday, ensuring Liverpool stayed top of the table after their 4-0 win at Bournemouth. Chelsea had lost two of their three previous Premier League matches as Maurizio Sarri's side fell away following their own unbeaten start, but they bounced back in style against City. Hazard, though, believes City remain the team to beat with Chelsea now eight points behind leaders Liverpool, who have a one-point cushion from Pep Guardiola's men. "It feels really good, especially after the game in midweek when we lost against Wolves," Hazard told Chelsea's official website. "It was a hard game, especially in the first half, but in the second half we controlled the game and we scored two goals. At the end I think we deserved to win and we need to go on. "When you lose you always need to show something because we are Chelsea. When we lose – for the fans, for the board, for everyone – we just want to win again. "Of course, the feeling is even better when you play against what I think is the best team in the country and you win. We can enjoy this." Hazard featured in a central attacking role as Sarri shuffled his pack, with Olivier Giroud named on the bench and Alvaro Morata left out of the squad. The Belgium international set up both Chelsea goals to take his assists tally in the Premier League this season to eight, more than anyone else in the division. "I like it, because I played it last year also, so I know what to do, but the feeling is a bit strange because you don't touch the ball a lot," Hazard added. "You just need to focus on what you need to do and I tried to do my best, we won and that is what is important. "We just want to win games and now this one has finished, we can enjoy the win, but we need to be focused for the game on Thursday [against Vidi in the Europa League] and next week at Brighton."